"Good luck with President Trump." There was a time when Supreme Court justices at least pretended to be apolitical, but apparently that practice went out the window when one party nominated a reality-TV star with an incoherent-yet-scary agenda. 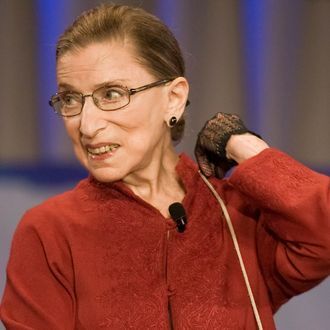 In an interview with the Associated Press on Friday, Justice Ruth Bader Ginsburg called the next president “she,” and said of a potential Donald Trump win, “I don’t want to think about that possibility.” Just in case that was too subtle, on Sunday she joked in a New York Times interview that she’s fleeing the country if Trump wins — though, unlike many fellow liberals, she’s considering Hobbit country, not Canada. Ginsburg is actually highlighting a point that Trump keeps stressing. In arguably his smartest political move, Trump released a list of his 11 potential Supreme Court nominees in May. That reassured Republicans that he’d attempt to put a judge with solid conservative credentials on the bench, rather than trying to make Justice Sarah Palin happen. During his otherwise disastrous trip to Congress last week, Trump vowed to GOP lawmakers that he would stick to that list if elected. Representative Mark Sanford told McClatchy that while he finds it “dangerous and alarming” that Trump is “fairly casual with facts” and talks about wanting to punch protesters in the face, fellow Republicans may be willing to overlook that if it means nominating three conservative justices. “If you care about the composition of the court, that alone will push you there,” he said.